Travis Pastrana lives his life on the edge. Recently, he jumped over it. On Wednesday, September 26, Pastrana hopped a flight from his home in Davidsonville, MD, to Arecibo, Puerto Rico, to perform a stunt he’s been dreaming up for more than a year. The next morning, four members of his group skydived from a single-engine Cessna from 12,500 feet. 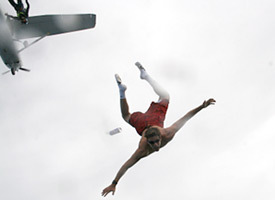 Pastrana performed his jump wearing only sunglasses, socks and surf trunks while holding a can of Red Bull. Crouch start, on the blocks. Pastrana knows his first kick could be his last. He was not wearing a parachute. The jump was the latest in a string of stunts the motocross legend is filming for his next video Thrillbillies, the fifth installment in his Travis and the Nitro Circus series. While it may not be the most dangerous stunt Pastrana has performed, it is his most shocking. In his past stunts, Pastrana has taken his life into his own hands. This time, he placed it in the hands of three men he’d known for less than a week. may come in handy, too. Best known for landing the first freestyle motocross double backflip at the 2006 X Games, Pastrana has a reputation for tempting the limits of possibility. Earlier this year, he revealed two stunts he was hoping to perform by the end of the year. The first—to duplicate his 1999 BASE jump into the Grand Canyon on a dirt bike, but with a girl riding tandem—he checked off his to-do list in March. The second—skydiving without a parachute—seemed better suited for a Hollywood stunt crew. Then, two weeks ago, he proved a 24-year-old action sports star would do just fine. "It sounds crazy to most people," he said back in January, "but it’s very possible." Possible? Yes. Pastrana is not the first person to skydive without a parachute and survive. But he is very possibly the least experienced, with only about 100 jumps and a beginner’s rating to his credit. For that reason, he had a difficult time finding accomplices. "Xtreme Divers in Puerto Rico was the only non-third-world drop site that would consider letting us do this," Pastrana says. Even then, it took several months and many phone calls before he tracked down experienced jumpers Timmy McMaster, Scott "Plamber" Palmer and Bill Halsey—the men who were ultimately responsible for saving his life once he exited the plane. "I have almost 7,000 jumps, and there is no way in hell I would do what he did, but I grew up racing motocross, so when I got a call to do a stunt with Travis Pastrana, I said, ‘I’m in,’" says Halsey, an instructor at The Parachute Center in Lodi, Calif., who documented the stunt. Before the men agreed to take the assignment, they wanted assurance Pastrana was talented enough to safely perform the jump. So during a break in his rally-racing schedule in mid September, Pastrana flew the three men to his home in Davidsonville. They then drove to a drop zone in Williamstown, NJ, to choreograph the jump. "If I felt there was any chance he was going to die, I would have told him to find someone else," Halsey says. "I didn’t want crying kids coming after me, saying, ‘You killed Travis Pastrana!’ I couldn’t live with myself." 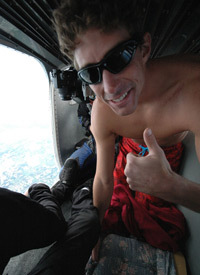 By the third practice jump (Pastrana wore a parachute for all but the final jump in Puerto Rico), the men were convinced the stunt could be performed with minimum risk. a slumber party or a jump out of a plane. "He’s good at everything he does," says Palmer, who had the most responsibility of the three men. Once Pastrana jumped, threw a few flips and steadied himself on his stomach, McMaster "docked" him by grabbing hold of his hands. Palmer then flew to Pastrana, hopped on his back and hooked his own parachute to a climbing harness Pastrana was wearing under his shorts, towing him in for the landing. "Right before we jumped, I had a moment. I thought, in two seconds, I’m going to be his last chance for survival. It’s all up to me now," Palmer says. "Then I looked at Travis. I’ve seen a lot of people jump, and I’ve seen a lot of fear. And there was none." Then, one by one, they jumped. "I had complete confidence in them," Pastrana says. "It was a lot of fun." So what’s next? "We’re already talking about the next stunt," Palmer says. "He’ll think of".